I haven’t dallied with electronics since high school. I soldered robot kits, and light sensitive buzzers. One summer I played with etching my own circuits. I couldn’t draft or silkscreen the boards, and I ended up drawing them with graph paper and a magic marker. The etching chemicals were toxic, and the experiment was short lived. 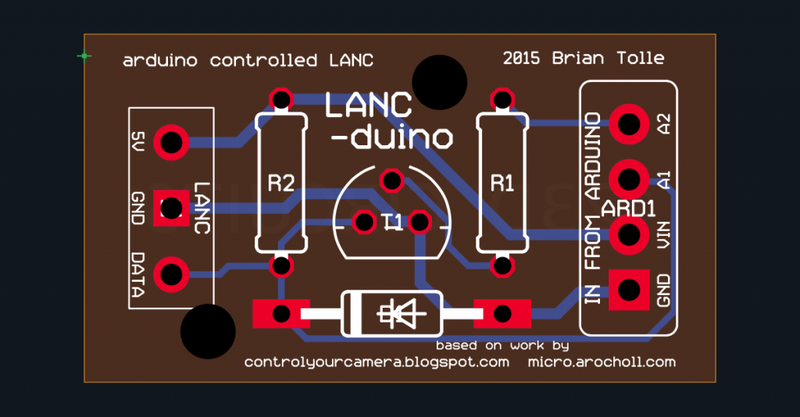 As I think about how I will use the LANC-duino as I’m filming, it quickly becomes apparent that taping a breadboard to the tripod leg might not work. But how to make a reliable circuit? I looked at perf boards and strip boards, and proto boards – but they seemed like they would end up in a chunky solder-y nest of wires, and I want this to fit in a case the size of a deck of cards. I want to make a printed circuit board, but I am not messing with screening and etching my own boards. So I turned to the internet, and it turns out that Autodesk has an online tool, 123D Circuits, that takes a virtual breadboard into a virtual PCB. And then, they will make the boards for you. I hooked it up on the website, and a day later I have a board. It’s tiny, and so sleek. As soon as the camera gets here, and I can test the circuits, I’m going to get the board made, they’re 3 for $11. I would spend more than that on perf board and wire. The board will be less than two inches long.